There is still much angst among Tiger fans because Placido Polanco was not offered salary arbitration following the 2009 season, and second base has been a problem for the club since. It's reached alarming proportions this season because Ryan Raburn has slumped so badly he was optioned to Toledo last night, and Ramon Santiago hasn't hit well, in addition to displaying a propensity for turning routine double play balls into costly fielder's choice disasters. But the biggest mistake, in retrospect, the Tigers made regarding their infield was choosing Santiago over Omar Infante following the 2006 American League pennant-winning season. Infante has gone to make an All-Star team as a utility infielder when he was with the Braves, and has since moved onto the Marlins where, playing second base, he is currently 10th in the National League with a .319 batting average and tied with Prince Fielder in OPS (on base and slugging percentage combined) at .880. His OPS has been .750 or better every season but one since leaving the Tigers. He is easily a stronger, faster, more productive player than any of the Tigers' current second base candidates. And the Tigers traded Infante to the Chicago Cubs for veteran outfielder Jacques Jones following the 2007 season. Just in case you need a reminder, Jones hit .165 in 90 plate appearances for the Tigers and by mid-May of the 2008 season was released. Santiago has done some good things for the Tigers, but his 162-game average season is.247 with six home runs and 39 RBI. His career OPS is .653. Infante's average 162-game season is .277 with 10 home runs and 55 RBI. His career OPS is .719. Oh, and at 30, Infante is two full years younger than Santiago. The two have roughly identical fielding percentages at second base. It wasn't like Infante was awful for the 2006 Tigers, either. He hit .277 and had a .740 OPS. He had some issues with manager Alan Trammell when he slumped in 2005, but those seemed behind him in 2006 under Jim Leyland. Also, Trammell was the bench coach in Chicago when Santiago played there with no incidents. Infante was arbitration eligible for the first time following the 2006 season, so his salary was kicked up to $1.3 million from $385,000. But still, Jones was paid $5.3 million that season, most of it by the Tigers, and after he was released (he played briefly for the Marlins later that season, and never again following the 2008 season). Replay of my live video chat today. We talked extensively about the Nick Fairley situation, Jim Leyland's outburst and whether it was good or bad and replay in baseball. We do this every Monday for about 45 minutes around 12:30 at theoaklandpress.com (it was Tuesday this week because of the holiday). We give away a prize (today it was a Lions cap) to somebody with a good statement or question. A live chat is set up - and we answer back through video. Check it out every Monday and participate. Hindsight is always 20-20. 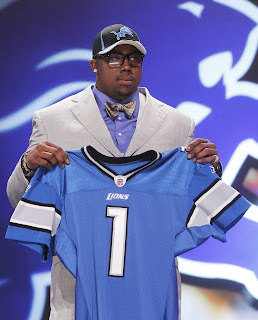 I thought the Lions made a great selection landing defensive tackle Nick Fairley with the 13th overall pick in the first round of the 2011 NFL Draft. Seemed almost too good to be true he was still there, which is proving to be the case given his off-the-field conduct. 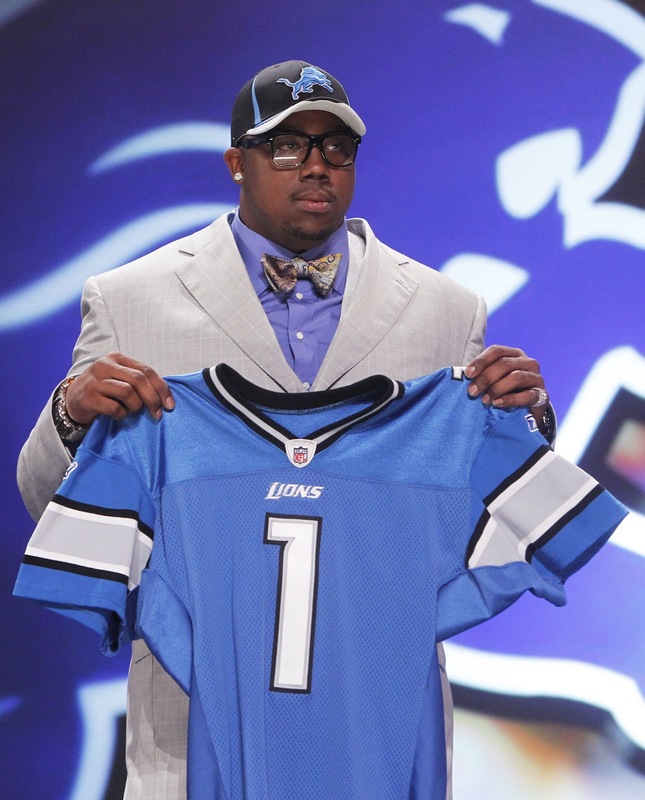 When Auburn won the BCS national title 2010, Fairley was to the Tigers' defense was Cam Newton was to the offense. He controlled games. There were suggestions before the draft that there were "character issues" involving Fairley, but they sure didn't translate to the field. 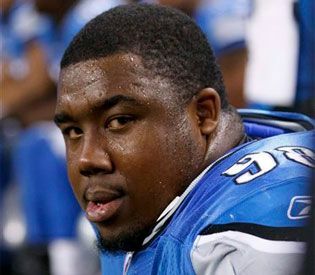 When he was introduced to the Detroit media, Fairley did say all the right things. 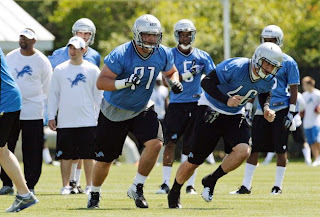 But it is turning out there might have been reasons besides a run on quarterbacks that a dozen teams passed on Fairley in the draft. Two recent well-documented off-the-field issues have brought them to the forefront. There are some issues that are obviously there, issues the Lions either didn't research properly and discover, or knew about and thought wouldn't matter. And they do matter. 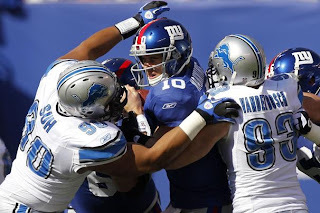 Fairley, whose injury-plagued rookie season netted just 15 tackles and a sack, could already be facing suspension from the league. Odds have gone up considerably that he will be bust rather than a star or even serviceable player. If that does prove to be the case, the Lions will have nobody else but themselves to blame. At the beginning of this season, one of the major issues surrounding the Tigers was how good they would be defensively with Prince Fielder at first base and Miguel Cabrera at third base. The answer: So far, not good. It was expected Cabrera would have some problems at third. I thought he would be disaster at third. He hasn't played as poorly as I anticipated, but he hasn't been even an average major league defender at the position, either. What I didn't anticipate was Prince Fielder's struggles at first. He has been terrible there the last week (three errors, all costly). These are the numbers. They speak for themselves. And nobody can defend these stats based on "the reason they make so many errors is because of their range and they get to a lot of balls...."
- Both Fielder and Cabrera have six errors, one behind the American League leader regardless of position, Baltimore Orioles second baseman Robert Andino. - There are only 10 players in the AL with six or more errors. - Besides Fielder, no AL first baseman has six errors or five errors. Only one AL first baseman has four errors (Toronto's Adam Lind). Only one AL first baseman has three (Baltimore's Chris Davis). The rest have two or fewer. - Fielder's .983 fielding percentage ranks at the bottom of those with enough chances to be listed on the MLB.com's stats site. No other first baseman listed is below .991. Cabrera's .946 fielding percentage is last among AL third basemen. - Last year, Cabrera led AL first baseman in errors with 13 (by three) and had the worst fielding percentage at the position, .991. Fielder's fielding percentage this season is considerably worse (.983) and he is on pace to make 23 errors this season. - Wednesday, with runners on a second and third and one out in the eighth inning of a 2-2 game, Travis Hafner of the Indians hit a routine grounder to first. Fielder threw the ball into the dirt, Tigers catcher Alex Avila couldn't hold it and Jason Kipnis scored the go-ahead run. The next hitter, Carlos Santana flew out, but instead of ending the inning, because of Fielder's error, it resulted in a sacrifice fly. Early in the season, when people would compare this team to 2008's disaster, I didn't see it. But honestly, the last week, the Tigers have played the exact same way. Their fielding has been awful, and it's started at the two corner spots, but especially at first base. In addition to the breakdowns and obvious flaws mentioned above, the Tigers have been horrific when it comes to producing clutch hits. Fielder's error wouldn't have mattered Wednesday if they hadn't blown so many opportunities at the plate, particularly a bases loaded, nobody out situation that produced zero runs in the eighth inning. But I still think eventually the run production will be there, but it will nullified if the Cabrera, and particularly Fielder, don't perform better defensively. It's not like the Tigers have options to change the way they are setup. This is the bed they made when they signed Prince Fielder, and while he is a tremendous hitter, it's been painfully watching them sleep in it defensively. You can debate the merits of the "it's early" and you must "be patient" or anything other sports cliches about the Tigers all you want. Yet, I will guarantee this, they will not "snap out of it" if they don't play better fundamental baseball than did during their 5-3 loss at Cleveland Tuesday. 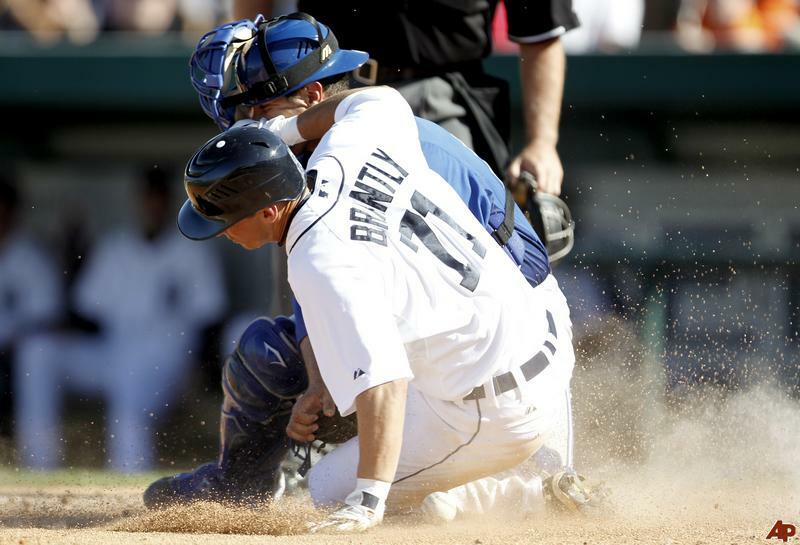 - In the first inning, the Tigers didn't turn a routine double play ball hit by Indians' second baseman Jason Kipnis. Now, Kipnis has good speed and hustled on the play (sound fundamental baseball, by the way), and the ball was not hit really hard. But Kipnis isn't Usain Bolt, either. The double play should have been turned. Lets put it this way, the Rangers would have turned it. Routinely. Ramon Santiago wasn't getting to the ball and then to Jhonny Peralta, and the relay throw to first wasn't particularly swift. It led directly to a run later in the inning, one that wouldn't have been scored. Lack of double plays is a major problem for the Tigers. They are last in the Major League with 26. 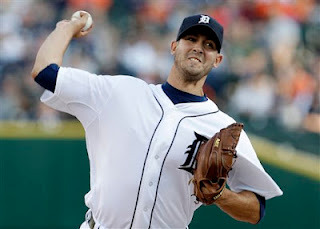 It really hurts pitchers like Porcello and tonight's starter Doug Fister because they rely so much on ground ball outs. Later. Brennan Boesch dropped a line drive that led to another unnecessary run. - The Tigers haven't played well defensively behind Porcello all season (the Brandon Inge debacle at second base vs. Texas very early in the season, Prince Fielder dropping a routine throw in the first inning of his last start vs. Minnesota, more Keystone Kops Tuesday). Yet, Porcello didn't help his own cause. When you have a team like the Indians just taking off running on pitchers like they did Tuesday, it's disturbing. Then, after Michael Brantley, who does have good speed, stole a base ridiculously easily off Porcello, he proceeded to tossed to first with the lead-footed Casey Kotchman there - and threw the ball away for an error. 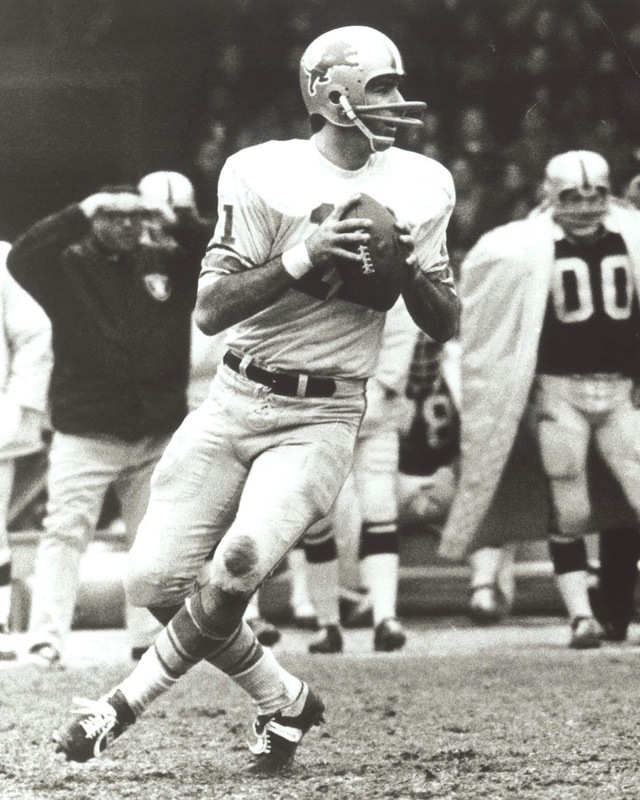 This issue of not holding runners must be paramount with manager Jim Leyland, and addressed immediately. Teams are taking advantage of the Tigers like they are a Little League team. And it not he catchers. Both Tiger catchers throw well. - Indians starter Ubaldo Jimenez walked six hitters. That was handing the Tigers the game. Other than one big hit, a 3-run homer by Alex Avila, the Tigers didn't nothing to take advantage of these gifts. - It was also disappointing, with two runners on in the ninth inning and the game on the line, that neither Miguel Cabrera and Prince Fielder came through. 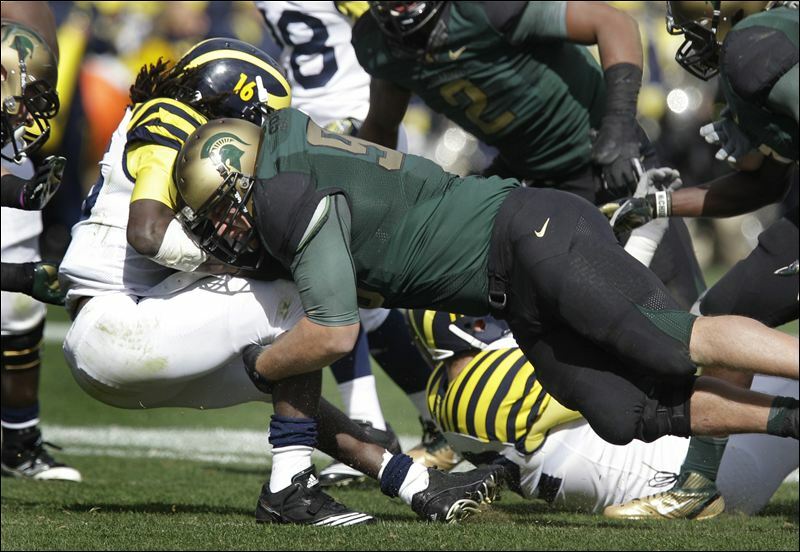 But if it weren't for blunders earlier in the game, it would have, at minimum, been tied. - The lumbering Tigers aren't going to win games with their fielding, but they can't afford to lose them, either. They must begin to make routine plays and execute the fundamental elements of the game much better, or this long spring will become a tortuous summer. Despite trading away several top prospects in recent years, the Tigers' farm system is not bare. When the trade deadline arrives, they will have options to deal other teams will undoubtedly covet. Third baseman Nick Castellanos has been much-celebrated as a prospect - and with good reason. He has the makings of a premier major league hitter. He is big and has plate coverage and will develop power. At 6-4, he has the type of frame that is only going to gain strength. He has an OPS of nearly 1,000 at high-A ball for Lakeland this season at just 20, which is very impressive considering his youth. But he's a third baseman. Miguel Cabrera is the Tigers' third baseman, in his prime and signed through 2016. 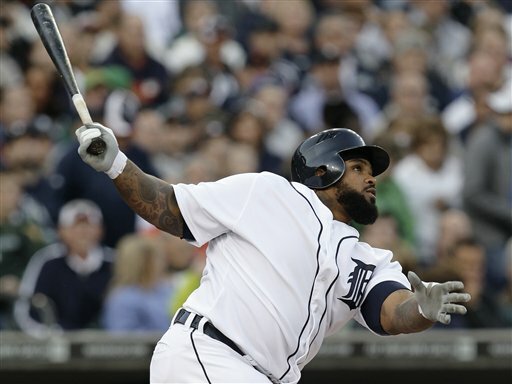 Prince Fielder forced the move of Cabrera to third. He is also in his prime and signed for nine years. There is no place for Castellanos to play. It would be a stretch to make him an outfielder or full time DH. He played shortstop in amateur ball when he was young, but he struggles at third defensively with errors (.915 fielding percentage so far in the minor leagues). He has already outgrown shortstop physically. Common sense dictates the Tigers could add significantly to their current club if they are willing to part with Castellanos. Another prospect who is emerging and will bring value at the trade deadline is Rob Brantly. He is a left-handed hitting catcher - a premium commodity - who consistently makes contact and is improving defensively. Alex Avila, the Tigers' All Star catcher, is 25. The Tigers have some depth at catcher. Their first pick in last year's draft, James McCann, is a catcher. He is considered the superior defensive catcher to Brantly. But the Tigers haven't been burned too badly in this area. I thought they might when they gave up their top position prospect, third baseman Francisco Martinez, and top minor league reliever, Chance Ruffin, for Doug Fister last summer. I was wrong. Both those players are struggling mightily in the minor leagues for Seattle, while Fister has been terrific for the Tigers. Cameron Maybin was a great prospect. He has become an average major league player. Pitcher Jair Jurrjens, dealt to the Braves, has panned out the best of the younger players the Tigers have moved in recent years, but he's been up and down in regard to performance because of injury issues. What a team shouldn't do, is trade top prospects from areas they are lacking depth. In the case of Castellanos and Brantly, that would not be true if the Tigers moved them. 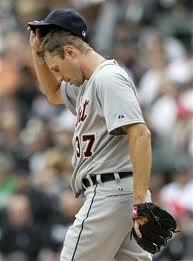 Anything less than an appearance in the World Series would be disappointing for the Tigers this year. With the stakes that high, they should trade their top prospects if there is value to fill holes in return. It's all about winning now for the Tigers, but it wouldn't be mortgaging the future, either, because of the way their major league club is currently set. Replay of my video livestream chat today for theoaklandpress.com. Got into a lot of frank and honest talk about the Tigers. Also talked about the Lions and the Super Bowl and whether they should be mentioned in the same sentence. We do this every Monday between 12:30 and 1:30 for about 45 minutes. It's just like a regular chat except we answer back live on the air to your type comments/questions. This is what you need to know about Justin Verlander if he does, indeed, throw a third no-hitter in his career: It's an indication of true greatness. The only three pitchers to throw three or more no hitters since 1900 are Nolan Ryan (seven), Sandy Koufax (four) and Bob Feller (three). Like Verlander, those true all-time greats and Hall of Famers were all the most consistently hard-throwing starting pitchers of their era. 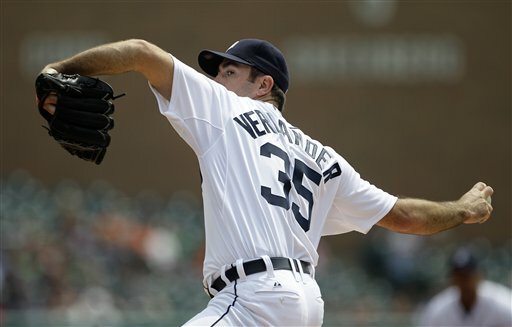 Also, Verlander has 23 more wins than any other active major league pitcher 29 years old or younger. 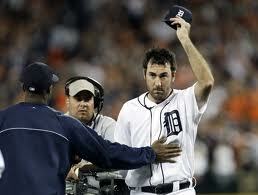 It would spell, health-willing, an almost-certain Hall of Fame career for Verlander. This isn't 2009. The Minnesota Twins are awful. It's one thing for the Tigers to go on the road and essentially split nine games (4-5) at Seattle, Oakland and Chicago. It's another to come home and immediately play awful baseball against the Twins, who might have trouble winning the International League. This isn't meant to necessarily defend Rick Porcello, the Tigers' starting pitcher Wednesday night, but that was "no-chance-for-the-pitcher" fielding by the Tigers. Porcello and Doug Fister get a lot of ground balls. Nobody is expecting the Tigers to display great range, but they must make the routine plays. Porcello didn't react to it well. There is no excuse for him to have an ERA over 5. His two-seam (sinking) fastball is as good a pitch as there is in the game when it is working. But if it isn't, there is still a lot there (a 94 mph four-seam fastball, decent off speed pitches). He is just 23, but has a wealth of experience in the major leagues and a top amateur pedigree. He should be better at this stage. But Wednesday's game would have taken on a completely different complexion for him had the Tigers just made the routine plays behind him. The Tigers must nip the habit of losing to bad teams at home in the bud. The series sweep by Seattle at Comerica Park was disturbing. It would be even more so if the Tigers were to lose today and be swept by the floundering Twins. Sometimes when Tigers manager Jim Leyland pushes the wrong button in this regard, at least you can see solid logic behind the move, even if it backfired. But not Monday during a 7-5 loss to the Chicago White Sox. Rookie left-hander Drew Smyly had allowed two home runs, but otherwise was pitching well, and U.S. Cellular is a small park. 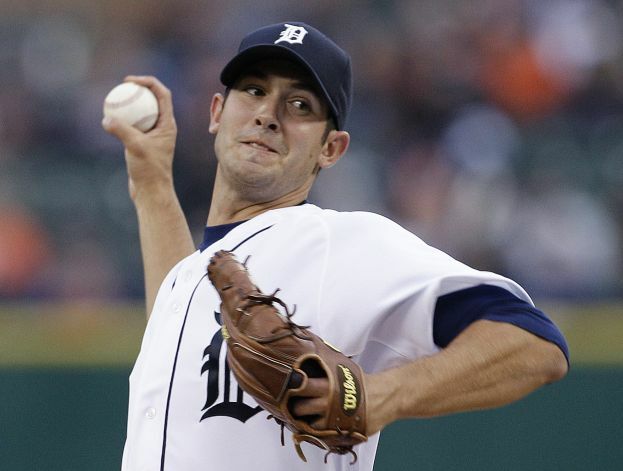 Smyly has pitched as well as any starter in the American League this season. He had earned the right based on performance, too, to begin the sixth inning. He had thrown just 69 pitches. It's questionable the pitcher replacing Smyly, rookie right-hander Luke Putkonen, should even be in the major leagues, let alone being handed the ball with a 5-4 lead on the road, the heart of the White Sox order coming up and with the Tigers struggling. The Tigers had much better options if Leyland wanted to remove Smyly, particularly veteran Octavio Dotel, who was rested. There will be classic "Leyland should be fired" overreactions to this, and it's misguided. 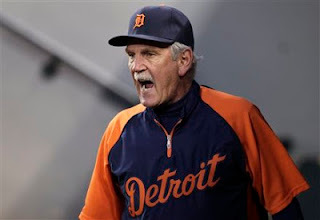 Leyland earned a lot more slack after what the Tigers accomplished last season, and given his overall track record as their manager. But this much is certain: Monday night will not go down as a career highlight for Jim Leyland. Sports editor Jeff Kuehn and I do this every Monday between starting a little after 12:30 for about 45 minutes. A Cover It Live Chat is set up, just like a normal chat. The only difference is we answer the questions and comments to you directly on camera while we discuss sports issues of the day. We also give away a book from my personal collection each week. Last week, it was the "Sparky and Me" written by Dan Ewald about Sparky Anderson. - 2011: When they won 95 games, the AL Central and advanced to the ALCS; 16-18, 7 games off the AL Central lead. - 2009: When they won 86 games and lost Game 163 after tying with Minnesota for AL Central title;18-16, tied for division lead. - 2008: When they entered the season with enormous expectations and fell on their collective faces with 88 losses; 14-20, 3.5 games off AL Central lead. - 2006: When they won the AL pennant as a 95-win wild card team; 21-13, 2.5 games off AL Central lead. - 1987: When they won an MLB-best 98 games during the regular season, but lost in the ALCS to Minnesota; 15-19, 7 games off AL East lead. -1984: When the Tigers lead wire-to-wire and won the World Series; 29-5, 8-game lead in AL East. 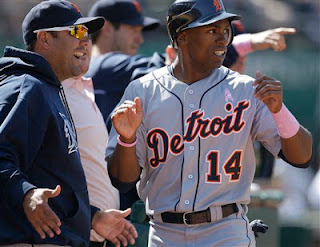 - Andy Dirks has become the flavor of the day for Tigers fans, and justifiably so. While the offense has generally sputtered badly, he played a huge factor in the Tigers' two victories on their West Coast trip so far. But there is a word caution I will add here: Dirks got off to a fast start last season, too, and by the end of the postseason was solidly planted at the end of the bench. Tigers fans do tend to get carried with outfielders who show initial promise (Clete Thomas, Josh Anderson, Nook Logan, Brent Clevlen, Alexis Gomez). The jury is far from in on Dirks, or Brennan Boesch, for that matter. Right now, the perception seems to be that Dirks is a better player than Boesch, but a month from now that could change. It's just the nature of the game. 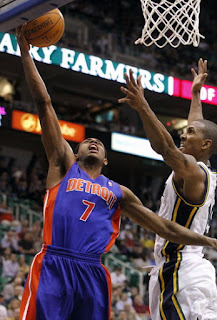 - Seasons don't work in one long consistent stretch for players and subsequently teams. They go up and down. Then it's all added up at the end. A key element for a winning ball club, though, is getting significant contributions from one player until he slumps, and then another, who had been slumping, to start then hitting. And to, of course, have enough every day players who are consistent throughout a given season. Same with pitching. Last season, for example, third baseman Wilson Betemit's contribution to the Tigers was very important. Brad Penny had a 7-4 record with a 3.51 ERA during a period when the Tigers were scuffling as a team. By the postseason, both had long before ceased being contributors. The fact the Tigers have hit this poorly, had a significant injury to a starting pitcher Doug Fister and dealt with a testy off-the-field issue in involving Delmon Young, and still have an above .500 record, is a good sign. 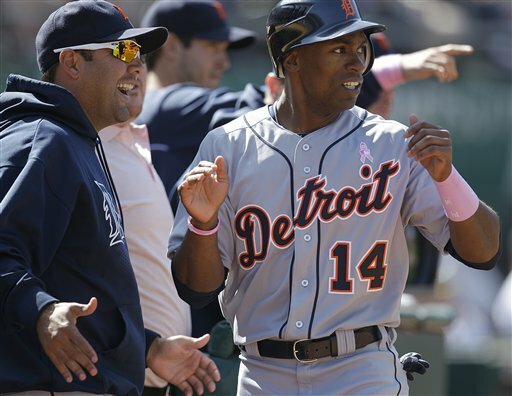 - I think the Tigers are going to OK. Cleveland will play hard and relatively well. The Indians are solid and have a good bullpen. It's difficult to not be impressed with Manny Acta as a manager. Ultimately, the Indians just don't have Tigers starting pitching nor firepower. The White Sox have improved in some ways, but their bullpen issues are confounding. 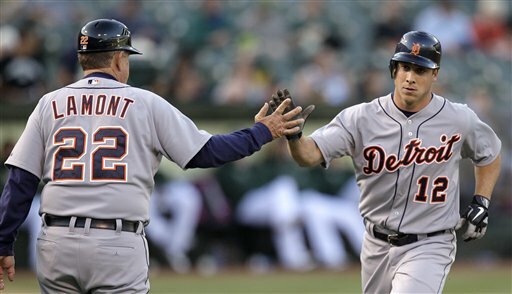 - Oakland is the perfect fit for Brandon Inge. The A's .216 team batting average is the worst in the major leagues. He has hit a couple grand slams for the A's, but is still hitting just .222 for Oakland and .179 overall. The A's are paying him a pro-rated $400,000 per year to get them through a season they are clearly headed no where. Inge is the updated version of Billy Beane's "Moneyball" player: Low on-base percentage, high strikeout ratio, low cost, zero expectations. - Jim Leyland should not keep playing Ryan Raburn when he is hitting .130. It's gotten to the point of absurdity. Ramon Santiago is the bigger issue, though. He needs to hit well enough against right-handed pitching so that Leyland can set up some sort of platoon at second base with Danny Worth or Raburn - should he snap out of his slump. It might be a good idea for Leyland to play Worth a few days in a row to see what he can do. He isn't going to hit any worse than Santiago and Raburn so far (that would be impossible) and he is an excellent middle infielder. Josh Hamilton hit four home runs Tuesday night at Baltimore, and it has accelerated what was already a tremendous start. He is unquestionably one of the most talented players ever to play the game. If it weren't for substance abuse problems that delayed the start of his major league career by several years, Hamilton would be a certain Hall of Famer. As is, he is a long shot at best for that honor. Few would dispute he is a Hall of Fame talent, though. Miguel Cabrera is off to a tepid start. His OPS is still above .800, but he can do that by osmosis. He is one of the most talented hitters of all time. Both are great players, who have had extensively documented off-the-field issues. Given a chance between the two, I'd take Cabrera, however. Since he was 21 years old, Cabrera has averaged 158 games played each season, never playing fewer than 150. He has had some years that were better than others in regard to hitting in the clutch. His first two seasons with the Tigers, Cabrera was not as good a clutch hitter as his reputation otherwise suggested. That changed in 2010 and 2011. While Hamilton has played on back-to-back American League pennant winners, Cabrera played a key role for a world title team early in his career with the Marlins. While Hamilton has won an MVP Award, Cabrera could have easily won it that season (Cabrera has finished in the Top 5 in MVP voting five times). Hamilton plays a premier position, center field, which is an obvious plus for him. He also runs well, while Cabrera not only does not have good speed, but is a poor base runner fundamentally. He is a good first baseman defensively, and a below average third baseman. 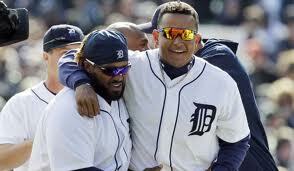 Thing about Cabrera, though, he is always there. You can almost put his numbers down at the start of the season and project what he is going to do. Hamilton is far more iffy. His numbers in 2009 and 2011 were down, albeit because of injuries. Also, Cabrera is two years younger. I tweeted this Tuesday night: "A great game by Josh Hamilton, but is he truly a great player? I get the sense when his career is done, it'll be about what could have been." It was my initial reaction to his brilliant game. Some people took it as a slam on Hamilton. It wasn't meant to be. He is to be commended for coming back and having a career. It didn't seem possible in the early 2000s, especially reaching an extraordinary level. It speaks to his gifts, and his tenacity, but also to what could have been if he were fully able to apply himself from the moment he was drafted first overall by the Rays in 1999. Given that Cabrera, foibles and all, has applied himself from the very beginning speaks more loudly for him as a truly great player. 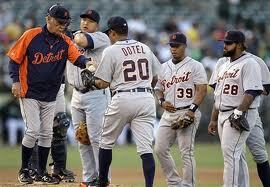 The past week, the Tigers bullpen, and the way manager Jim Leyland has handled it, has been criticized. It's justified. Jose Valverde's been alarmingly shaky this season. Joaquin Benoit has not been much better. The save Valverde blew against Chicago Saturday was disturbing. Monday night at Seattle, it was understandable why Leyland didn't use Valverde with a 2-0 lead in the ninth. He had pitched the previous three days. But why not Benoit instead of Octavio Dotel? Well, Dotel had been the better pitcher up to that point of the season, but he pitched poorly Monday. He started walking hitters, the onslaught ensued and the Tigers lost. It was the second time in three games their bullpen couldn't hold a lead. While the woes of the bullpen are likely the Tigers' biggest long-range concern, it wouldn't have become this much of a factor, this early in the season, if the Tigers were hitting better. For a lineup that is supposed to be among the most productive in baseball, the Tigers hitters have been below average. Their .249 team average is below the American League overall mark of .250. The Tigers also below the American League average in runs scored, hits, OPS and doubles. In their last five games, the Tigers have scored two runs three times, three runs once and five once. The Tigers haven't necessarily been seeing the best pitching, either. None of Seattle pitchers that worked against them Monday, for example, had an ERA of under 4.00 entering the game. It's not just one segment of the lineup that isn't clicking, either. It's the entire lineup, including the big guns, Miguel Cabrera (0-for-3 with runners in scoring position Monday) and Prince Fielder have been under-performing, although Fielder has shown signs the last couple days of snapping out of it. Slumping Delmon Young and Brennan Boesch are other key factors. I know Andy Dirks is a fan darling, and so far he has done OK in the second spot in the order, but he must maintain his performance better than he has in the past when he has been streaky. The Tigers have won two of their last five games - despite their lack of hitting. Their pitching isn't that bad, but their fortunes are based on offensive production. They are not built to help their pitching staff with speed and defense, but rather with run support. The sooner the Tigers start to provide that run support, the better their bullpen will become. 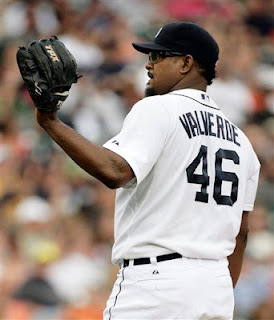 Ideally, Dotel would have been used in a mop up role Monday with Valverde unavailable. I do expect the Tigers bullpen to stabilize, but it won't happen until it is not forced night after night to be the deciding factor. My view on the Red Wings, and what has transpired during these Stanley Cup playoffs, differs with the consensus of opinion. 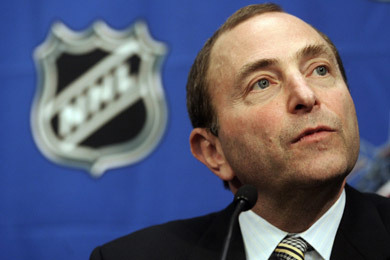 Where most feel the Red Wings "just weren't good enough," I, instead, see the Red Wings as having vastly underachieved. The way the playoffs have unfolded since the Red Wings ouster in five games by Nashville is affirmation. The Vancanover Canucks and St. Louis Blues proved to be vastly overrated, both getting knocked out of the Stanley Cup playoffs by the eighth-seeded Los Angeles Kings. The Predators have come unglued in the Western Conference semifinals vs. Phoenix. The Kings have a tremendous goalie in Jonathan Quick, a world-class defenseman, who had not lived up to his growing after reputation after the 2010 Olympics, though, until these playoffs in Drew Doughty, and a Henrik- Zetterberg-like forward in Anze Kopitar. Otherwise, they have a little grit in Dustin Brown, and not much else. The Coyotes best player is Ray Whitney. Yeah. That Ray Whitney. the former Red Wing, who has been around since time started. And Phoenix goalie Mike Smith is the definition of journeyman. The Blues and Preds don't have fire power. Vancouver has an excellent team, but the Canucks' issues with being Canada's great hope, and goalie Roberto Luongo having worn out his welcome, led to subpar performance. 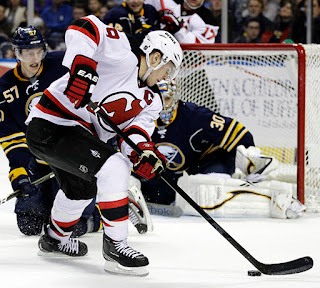 This should have opened the door to the Stanley Cup finals for the Red Wings. Instead, we're reading about the exploits of their players at The World Hockey Championships. Now they are scoring goals. Now Jimmy Howard is coming up big. It couldn't be be more meaningless if they just remained home and were shooting par on one of the local golf courses. 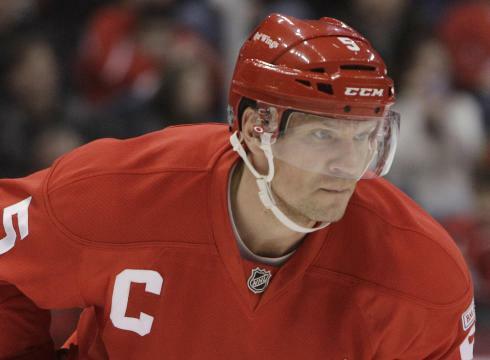 There is little doubt the Red Wings need to re-tool their roster this summer. But the Kings vs. Coyotes in the Western Conference finals? The Red Wings are still better than both those teams. The Chicago White Sox visit Comerica Park for the first time this season over the weekend as a refreshed ball club. Their starting pitching is pretty good. The White Sox team ERA is considerably better than the Tigers (more than a half-a-run per game) despite playing their home games in a band box ball park. Robin Ventura is a low key manager, just what the White Sox needed. It's clear Ozzie Guillen's message stopped getting through. But having pointed to those factors, the White Sox are still just a 12-12 team, like the Tigers. The Cleveland Indians have played pretty good baseball to start this season, but are only two games above .500. Last year, the Indians got out to a 30-15 beginning and then gradually faded. I like the way the Indians approach the game, but I see the White Sox as the bigger threat to the Tigers in the American League Central because of their starting pitching. It's still the key element of the game. It's the part that could determine whether the Tigers run away with the AL Central again or get into a fight. That's where Max Scherzer and Rick Porcello come in. They are at a stage when development is supposed to end and consistency be the result. Yet, Porcello's performance still goes up and down like yo-yo. Scherzer did get squeezed by umpire Rob Drake in New York last weekend, but, still, that was not a good start, and his lack of command has sent up a red flag. Thirteen walks in a 24 innings is too much. He falls behind the count a lot. Hitter's have been taking advantage. His WHIP is over two.Saturday's start, Gavin Floyd vs.Scherzer, will be a fascinating one. Floyd has given the Tigers a lot of problems (7-2, 3.48 ERA in career, six shutout innings in his first start against Detroit this year). Can Scherzer match him? What about Porcello Sunday against hard-throwing Aaron Sale? It will be back-to-back Scherzer and Porcello starts against what will probably the Tigers biggest threat in the division. Will they start to perform with some level of consistency? If they don't, winning the division is still probable, but could be more difficult of a journey than had been anticipated. If the Tigers are, indeed, better than this, why aren't they playing like it? - There is no way to look at today's outing by Joaquin Benoit's and not be concerned. Tigers manager Jim Leyland should strongly consider flipping roles and making Octavio Dotel their primary setup man. - Justin Verlander is not Super Human, after all,. Last season, he was. But don't forget, even though Verlander posted exceptional numbers by the end of the season, his April numbers were not that impressive. They were just impressive compared to the past when he had struggled mightly in April. - The Tigers are not hitting, but there reasons for it. They are not taking opposing pitchers deep into the count. Today they had very quality at bats early in the game. They made it easy in Royals' starter Jonathan Sanchez. 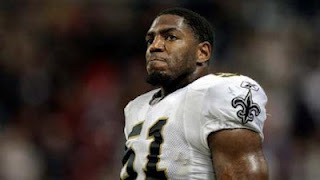 I find it laughable how there is a segment of the NFL - whether it be fans or players - that is actually sympathic toward Jonathan Vilma and the other New Orleans Saints players suspended by the league for their part in the team's pay-to-injure bounty program. It's kind of like the same defense for a politician when they get caught doing something they shouldn't. Suddenly, it becomes about "snitches" and "they were only guilty of being caught." 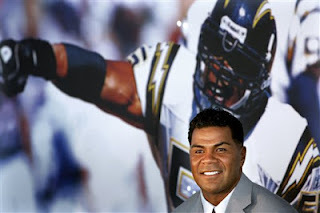 Vilma is a terrific player, and being tough and violent is very much a part of being a successful linebacker in the NFL. But that doesn't excuse putting up money to deliberately injure opposing players. That's something that is not only against league rules, but society's rules. People go to jail for paying others to injure another person in real life. I understand the NFLPA's need to protect the due process of its members, and in general protecting their overall rights. What I don't feel would be appropriate is if the NFLPA plays Vilma as a victim here. Isn't the league, ultimately by ruling harshly in this instance, only trying to protect players? It should be disconcerting to the NFLPA itself on that front. They have to be careful here in their so-called defense of Vilma, and other suspended players, to not sound like they are condoning the behavior.